... and it supports a nonprofit organization that helps kids! For sale only to buyers with US addresses. The Jackalope is made of tan or grey felt, treated with a nonslip coating on top and rubber backing on the bottom. The rubber will not budge—but some typewriters may still slip on the top surface of the pad, depending on their weight, the composition of their feet, and your typing habits. So just in case, I provide a strip of black self-adhesive felt. If you cut it into squares and stick it on your typewriter's feet, they will grip the Jackalope pad and the machine will not move. There's enough self-adhesive felt for two typewriters. Pads vary in color and may include dark lines along one or more edges, as shown here. The regular Jackalope pad is about 12 x 13 x 0.25 inches and costs $13.99 including US shipping. It fits unobtrusively under just about any typewriter, portable or standard. the Jumbo Jackalope will do the trick. It's about 14 x 16 x 0.25 inches and costs $17.99 including US shipping. 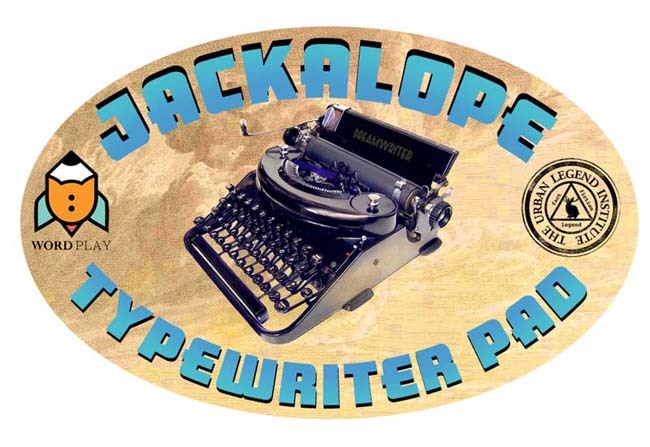 All profits from sales of the Jackalope pads go to support WordPlay Cincy, a nonprofit kids' tutoring and creative writing center in Cincinnati, Ohio that uses typewriters. Profits are either donated directly, or used to buy typewriters and supplies for Urban Legend Typewriters, the shop that supports WordPlay. So far, Jackalope pads have raised over $5000 to help this worthy organization. More (typed) testimonials can be found here. Pads are for sale only to buyers with US addresses, because international shipping has gotten expensive and cumbersome (you have to go to the Post Office, fill out a customs form, and wait while the information is slowly entered into the computer). 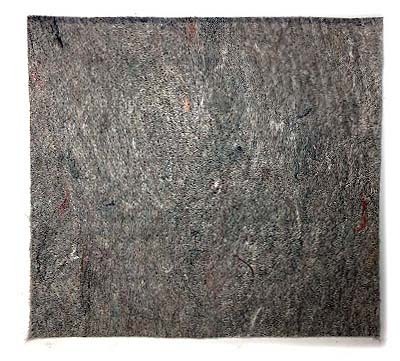 Prices include US shipping and self-adhesive felt (see above). Click the button below to pay with a credit card or PayPal balance. Would like to order a pad, but the paypal option just takes me to paypal without a link to who to pay. This has occasionally been a problem. I reinserted the code and it's working OK for me now. But if you have trouble, you can also go to PayPal.com and make a payment to polt@xavier.edu. Thanks! Just got the pad you sent me last Monday, with a very fast delivery (just five days) from USA to Sweden, and it was great! My Silver Reed 500 no longer slides slowly but surely to the right, and I didn't realize how much of the typing noise came from the writing desk. The joy of typing has just risen a few notches; thank you for that, Richard! Richard, just got my pad yesterday and it works great beneath my Smith-Corona portable. I will write you a "real letter" sometime, but just wanted to let you know I received the pad. Type on! When do you think you'll have these in stock again? I actually have them now, and have been so busy that I haven't announced it. But feel free to go ahead and order. Yes, but if you order one, please allow a couple of weeks, since I'm quite busy with travels. Now these would be handy for some of my little critters that like to walk around the table every time I use them. Do you have an idea of when the felt pads might be back in stock? OK, I am now officially announcing that they are back in stock. Feel free to order. I've just placed my order. Que bueno que todavía hay amantes de las máquinas de escribir. Love the pad, Richard. It is sitting under a 1934 Corona Silent (in Maroon) at the moment. And thanks also for your brilliant book. And the Pogo cartoon on this page! Seeing it made me go back to my collection of doings in Walt Kelly's cartoon swamp. (May it never drain). David T.
Not yet, sorry, as I am traveling. I think I should have more in stock after I'm home in early September. These look perfect. Is postage too dear for overseas? Postage does cost a lot, but the main problem on my end is that I have to go to the post office, fill out a form, and wait while the information on the form is slowly fed into the computer. That's why I have, regretfully, decided to offer them only to domestic buyers. Trouble with the link. May I send payment to polt@xavier.edu? If so, how much should I include for postage to 55387? My supplier has promised that I'll have them next week. Do you think you'll be mailing any out sometime soon? They are available now. If you've ordered one, it is on its way. Just tried to buy 2 pads and the paypal connection is not working. Options? You can just go straight to paypal.com and send $27.98 to polt at xavier.edu. Thanks! Do you sell these at the Urban Legend Institute location in Cincinnati? I'll be coming through in early June to check the place out and would love to make some purchases while I'm there to support WordPlay's cause. Thanks! Yes, we do have some pads there. As hours are irregular, please contact Sarah Nimmo (sarah@wordplaycincy.org) to make an appointment when you know when you will be there. 3. �� Email to the administrators at archivehumanitas.com for a chance to publish in the “4x6 Guestbook” section. See submission guidelines. Please pass this information along! AH is already yours! Thanks, Jeffrey! I will also post this on Welcome to the Typosphere and Facebook.